I kept hearing this song on the radio in the car and I automatically thought it was Joss Stone. Let me tell you how pissed I was when I couldn't find this song under Joss Stone because it is such a great song. "Rolling Stone, Artist To Watch"
“The foundation begins with soul,” explains 20-year-old singer/songwriter/producer Laura Izibor of her passionate, piano-guided songs. On her forthcoming debut album, Izibor continues the lineage set out by artists like Lauryn Hill and Jill Scott (I don't know if I would go that far! ); artists who combine a reverence for the traditions of early R&B with a thoroughly modern sensibility. After one listen to the powerful, honey-tinged vocals on Let The Truth Be Told, one thing is for sure. For Laura Izibor, it’s got to be real." Now I'm wouldn't put her in the category of Lauryn Hill and Jill Scott especially not after one song. Hell not after 5 songs will she be put in the same category as Lauryn Hill but the single "From My Heart To Yours" is HOT! I'm straight diggin' the song and will be buying the album that will be released June 16th. 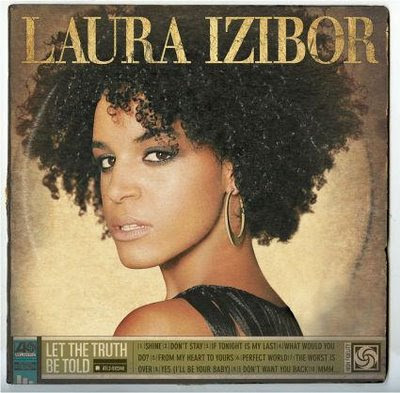 Here is Laura Izibor performing "From My Heart To Yours" live. I thought it was Joss Stone as well.